NOAA Ship Okeanos Explorer is outfitted with one of the very few deep-water multibeam sonars capable of providing water-column backscatter data. The primary purpose of this Gulf of Mexico expedition is to study the feasibility of using this capability to map gases in the water column. An image of the NOAA ship Okeanos Explorer's multibeam sonars trackline (shown in multiple colors) in the Gulf of Mexico. Image courtesy of NOAA Okeanos Explorer Program, Gulf of Mexico Expedition 2011. Download larger version (jpg, 295 KB). The northern Gulf of Mexico is an ideal site to achieve our testing objectives because of its large number of naturally-occurring seeps. Underwater gaseous seeps are fed by the natural underground accumulations of oil and natural gas. Once released from the seafloor, the gas bubbles often rise through the water column, creating oil slicks on the sea surface. Scientists have been using satellite imagery of these surface slicks to identify areas in the Gulf of Mexico where they believe oil is likely seeping from the ocean floor. However, matching a surface slick to a location on the seafloor is often difficult due to currents and weather conditions. 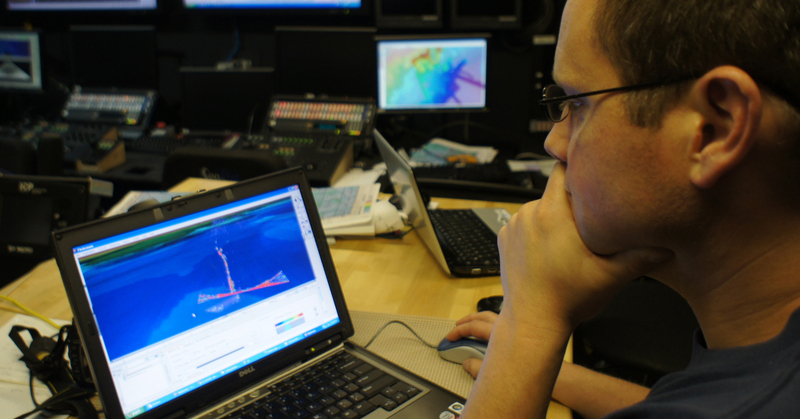 NOAA Corp's commissioned officer LTJG Glen Rice works on processing multibeam sonar seep data on board NOAA Ship Okeanos Explorer. Image courtesy of NOAA Okeanos Explorer Program, Gulf of Mexico Expedition 2011. Download larger version (jpg, 744 KB). 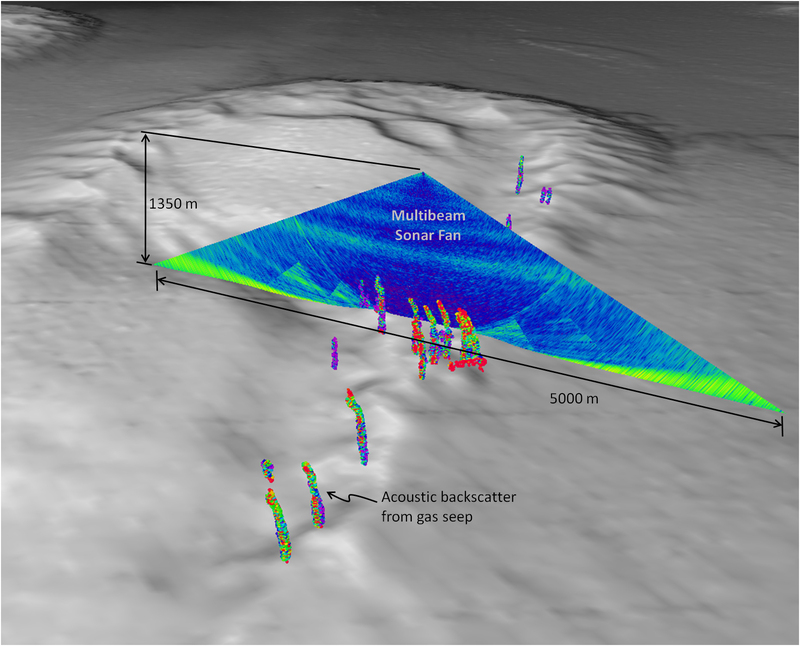 If the multibeam sonar system proves capable of mapping hydrocarbon gases in the water column, localizing the origin of a specific seep on the seafloor should be relatively easy. This capability could also prove valuable in identifying hydrocarbon leaks from manmade underwater structures. A perspective of the seafloor showing preliminary results of gas seeps in vicinity of Biloxi Dome in Northern Gulf of Mexico. 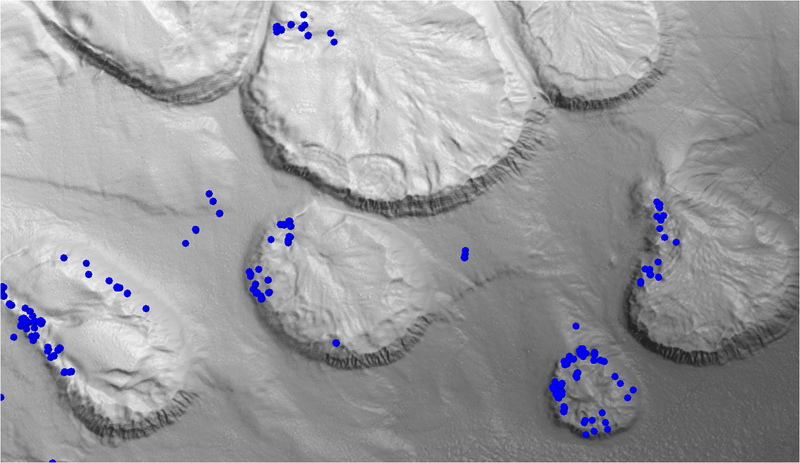 Detected by NOAA ship Okeanos Explorer's multibeam sonar, the gas seep locations (blue dots) are shown overlaid on the seafloor bathymetry that was also collected. Image courtesy of the University of New Hampshire Center for Coastal and Ocean Mapping/Joint Hydrographic Center using IVS Fledermaus software. Download larger version (jpg, 602 KB). Natural gas seeps overlaid on the background bathymetry (shown here as gray-scale sun-shaded bathymetry). 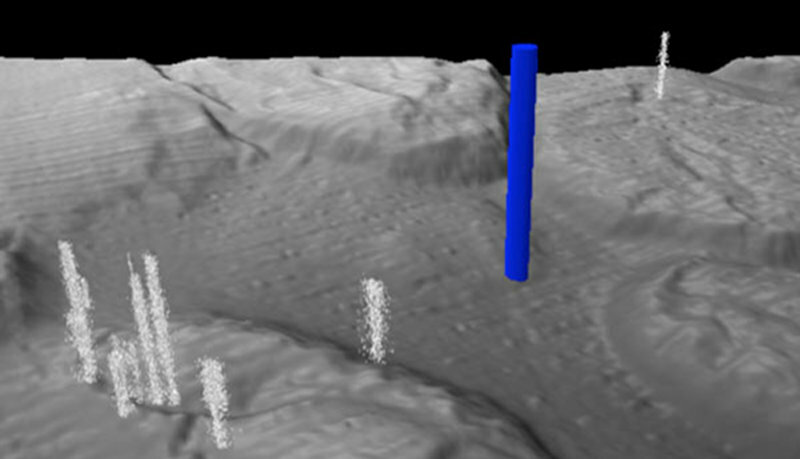 The white vertical structures rising above the seafloor are the seeps derived from NOAA ships Gordon Gunter and Thomas Jefferson's 12/18 kHz split-beam echo sounder during their 2010 work in Gulf of Mexico. Note the location of the Macando Well head (shown as a blue cylinder). Image courtesy of the University of New Hampshire Center for Coastal and Ocean Mapping/Joint Hydrographic Center using IVS Fledermaus software. Download image (jpg, 42 KB). Results will help identify future uses of the multibeam system and other water-column imaging-enabled sonars on a larger scale in the Gulf of Mexico. This cruise will rely on collaborations between NOAA Ocean Exploration and Research (OER), University of New Hampshire, Center for Ocean & Coastal Mapping (UNH-CCOM), NOAA Fisheries Southeast Fisheries Science Center (SEFSC), Bureau of Ocean Energy Management, Regulation and Enforcement (BOEMRE), and the NOAA Office of Marine and Aviation Operations (OMAO). 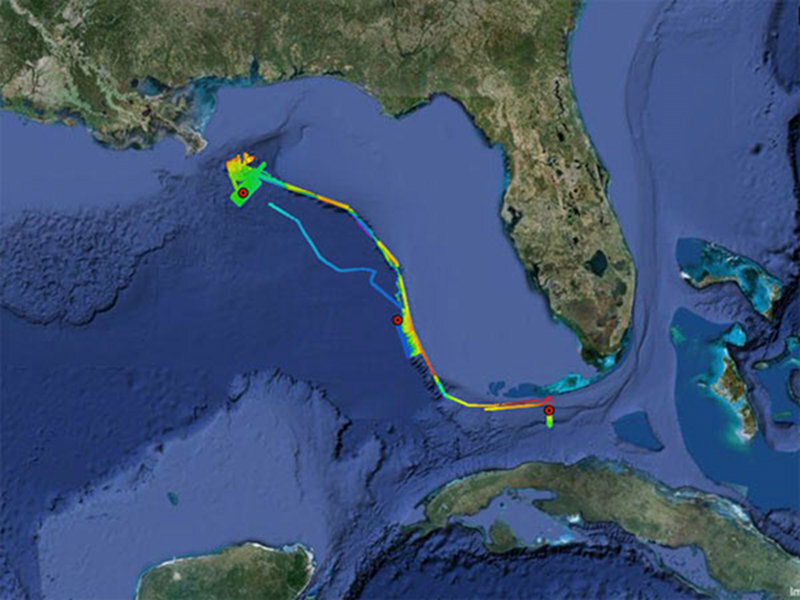 Previous collaborative work between UNH-CCOM and NOAA following Deepwater Horizon demonstrated the capability of single-beam fisheries sonars for accurately mapping gas seeps. 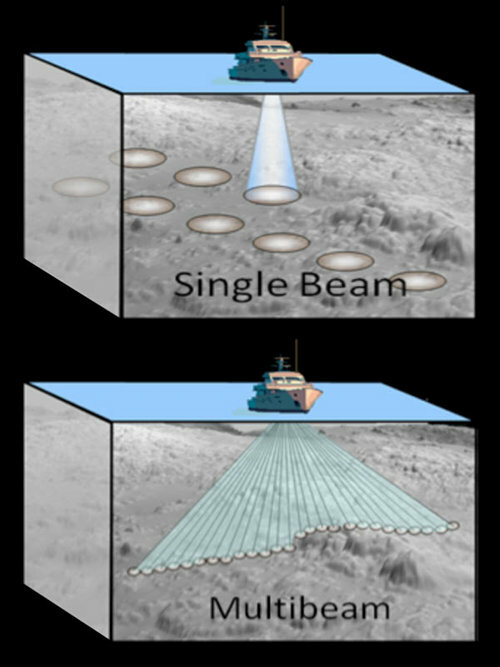 Although quite successful, the survey coverage of the single-beam sonar is limited to a narrow swath underneath the vessel. With its increased swath width, the multibeam sonar offers the possibility of greatly increasing the seep survey efficiency. 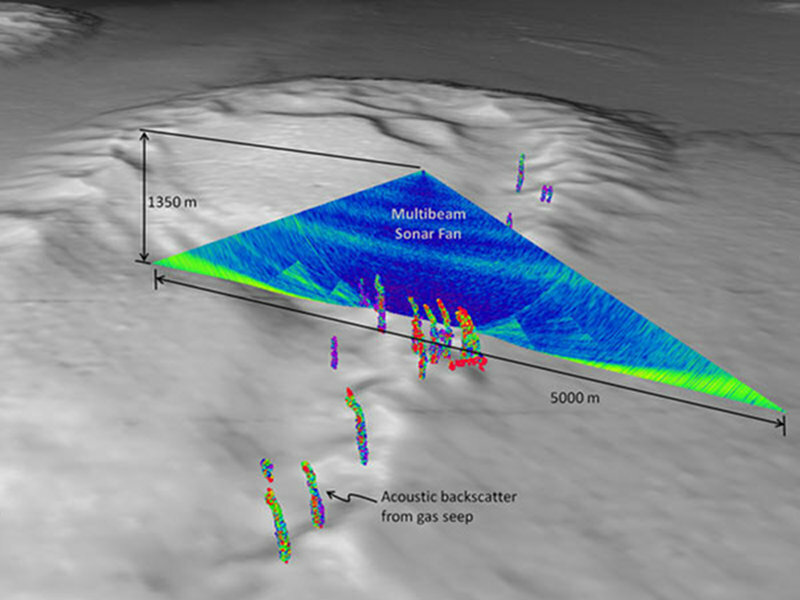 A view of the multibeam sonar water-column backscatter data used to detect gas seeps. Gas seeps derived from the sonar are shown in the foreground. Image courtesy of the University of New Hampshire Center for Coastal and Ocean Mapping / Joint Hydrographic Center using IVS Fledermaus software. Download larger version (jpg, 879 KB). In addition to detection and localization applications, the sonars on the Okeanos Explorer are being examined for their ability to provide information regarding the seep morphologies, general makeup, and relative densities. To help in these efforts BOEMRE representative Bill Shedd on board the Okeanos, providing the benefit of his many years of experience working in the Gulf. 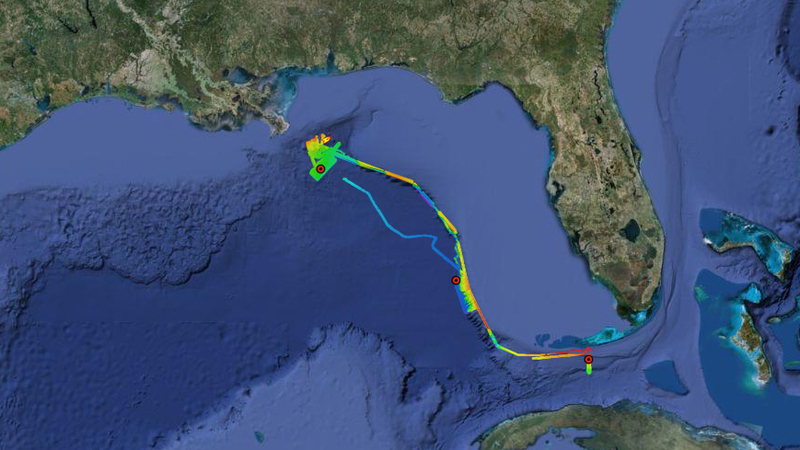 The BOEMRE-OER collaboration is the outcome of an evolving partnership that began in 2004, focusing on exploring and understanding deepwater habitats in the Gulf of Mexico. This schematic diagram shows areas of coverage by single-beam and multibeam sonars. Image courtesy of Dr. Tom Weber, University of New Hampshire Center for Coastal and Ocean Mapping/Joint Hydrographic Center. Download image (jpg, 51 KB). The overall expedition will also benefit from a few days of collaborative operations with NOAA colleagues on board the NOAA ship Pisces, which carries a comprehensive suite of standard fisheries sonars. Cross-checking the sonars on both ships will increase the capacity of both vessels to support multi-purpose operations. Assistance from the Pisces will improve Okeanos Explorer capabilities for both gas-seep detection and fisheries-relevant data collection. The presence of the Okeanos Explorer will improve Pisces’ sonar operations for hydrographic mapping efforts, increasing the capacity of both vessels for multi-purpose missions. 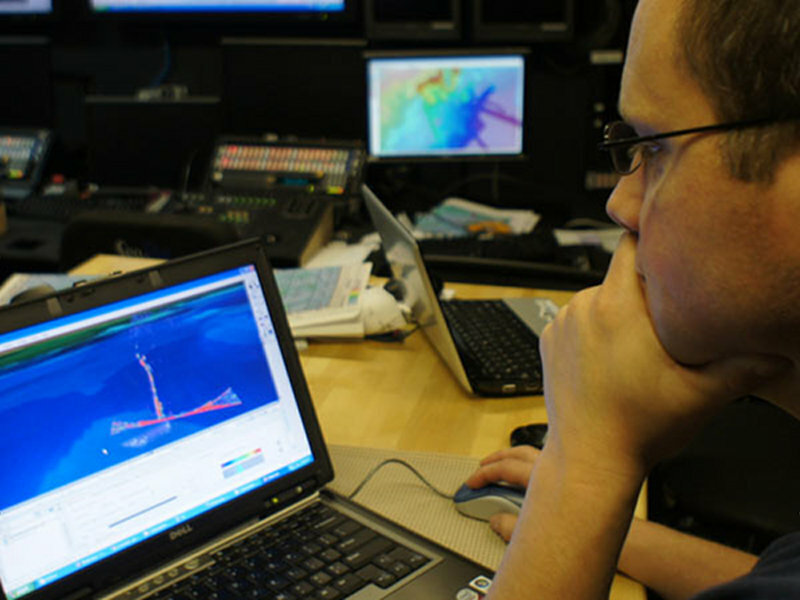 In addition to the ship’s crew, cruise participants include Mashkoor Malik from NOAA OER; Bill Shedd from BOEMRE; Tom Weber, Jonathan Beaudoin, Kevin Jerram, and Maddie Schroth-Miller from UNH-CCOM; and LT Glen Rice from the NOAA Office of Coast Survey. Ship survey staff constitute of SST Colleen Peters, SST Lillian Stuart and Gustav Karl Kågesten (University Corporation for Atmospheric Research/OER).